Joyous thoughts race through your head, and you thank Old Man Winter for the gift of another day off. Then, suddenly, it hits you. You remember that you have online school. After two snow days without assigned school work, according to school policy, on missed days due to weather or other extraordinary circumstances, students are required to complete work assigned online for the classes (Green or White) that would have taken place that day. The policy is designed to allow students to continue working at home and not have to make up school days later in the year. “I think everyone likes the idea of not making up days at the end of the year,” veteran Trinity teacher Mr. Frank Ward said. And that was indeed the consensus I got from students I interviewed. It makes a lot of sense because no one wants to come back and roam the halls after Memorial Day. This semester has had three White Day online assignments due to inclement weather and one Green Day missed for the Sweet 16. But is this current system of online school effective? Can it be improved? Ward recently ran a discussion forum with his E300 AP English Language class, and he told me there was about a 50/50 split between students finding the online school effective and those who did not. Ward told me the students who found the work to be effective said it helped review some topics from the previous several class periods. “It helped reinforce some things we had learned recently, and I felt like I benefited from that,” Trinity junior Eric Harbrecht said. All interviewed mentioned that although the work could seem a little tedious, they found it somewhat related to class. And that is one benefit to the current system. Ward said teachers can update online plans to be relevant to what is going on in class at the time. Online plans are due to be posted by noon on days school is missed. 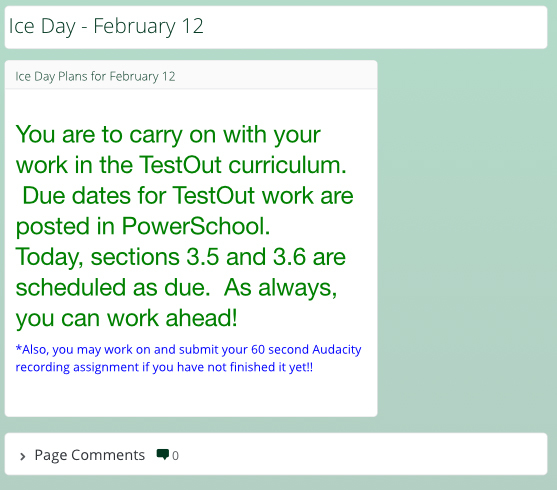 This, according to Ward, affords teachers the time to get up and put together a productive assignment. One flaw I discovered was the inconsistency in some of the workload. According to Ward, teachers are to aim for an assignment that should take about 30 minutes to complete. Some students said assignments lasted a mere 15 minutes and some took an hour and a half. I experienced these same inconsistencies myself. 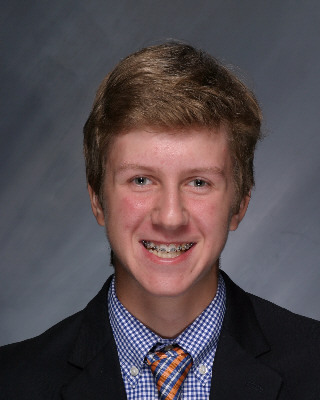 Junior Colin O’Connor said his electives required more work than core classes on the most recent snow day. On the other hand, sophomore Sebastian Mata said he had very little work for his electives but was loaded up in his core classes. How do we find the middle ground? It’s tough on teachers because they are not sure if students have their textbooks, and they also don’t know what kind of access students have to devices. Junior Jacob McCarthy said, “I like the system; we just need to clean it up a little.” I think McCarthy is right. Ward believes there is no way to completely replicate in-class learning, but I believe we can get close. 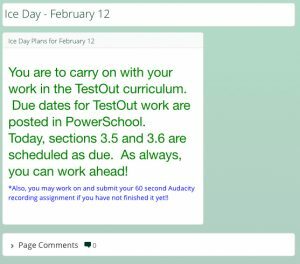 Students said the most productive assignment was either a voice-over PowerPoint with the scheduled lesson for the day or guided notes from a PowerPoint or text. The students who had these assignments felt as if no progress in the class was really lost, and they were able to roll along with the coursework. A system of guided notes or voice-over PowerPoint lesson for each class would be the best way to do online school, in my opinion. A simple 30-minute lesson for each class would not require textbooks. All a student would need is access to the Internet. This would allow for teachers not miss a beat in class (or miss as little as possible), and it would allow students to learn the scheduled course material for the day, negating the negative academic effects of a missed day. With this proposed system, it would take teachers five minutes at the beginning of class to make sure everyone is caught up instead of an entire period. There is no magical answer to replacing in-class learning online, but I believe the consensus around school seems to be that we are on the right track, and that we are just a few steps away from a system that is as efficient as possible. After all, who wants to sit in a classroom to kick off the summer?